Clear all 63 jellies bring dawn all ingredients and reach 40000 points to complete the level. This level has medium difficulty. 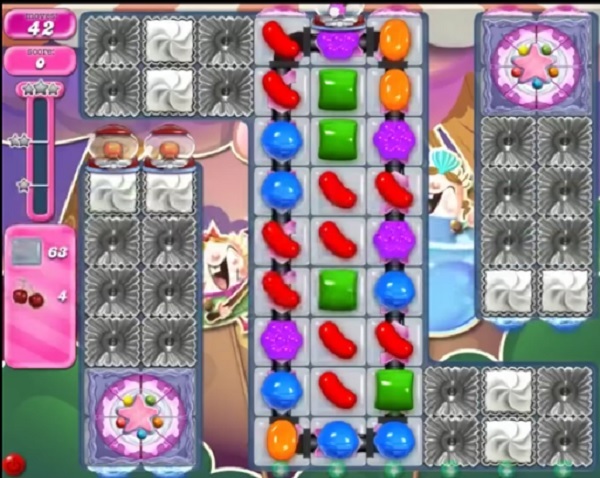 For this level try to play more from middle part of the board and use striped candy as you get the chance. Then play near to cake to break them to get more chance to break the blockers and jellies plus will help to move ingredients. Help another mindless game almost impossible been playing now for 3 days and not getting anywhere. Agree with comments. Another sh** level. No choice of coconut booster either. Why have some games got it. Time to delete the lot…to time wasting. No coconut wheel for me either is anyone else struggling with this one. Another thing I’m not receiving my lives off friends so I’m having to wait for my lives. 1758 completed! 6 boards! LL cakewheel releases cherries UR wheel drops cherries. 1758 completed on first attempt ?